(Photo: REUTERS / Erik De Castro)Residents look at a ship that was swept by Typhoon Haiyan nearly two weeks ago, in downtown Tacloban city in central Philippines November 21, 2013. 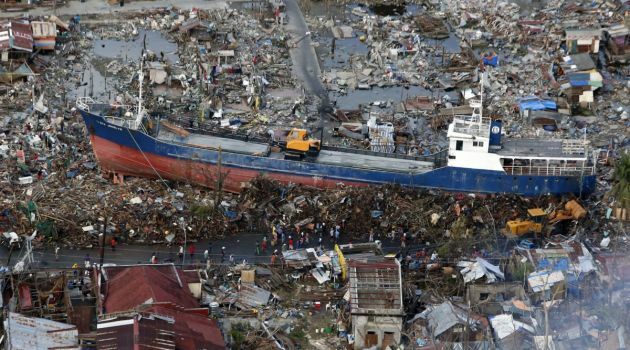 Typhoon Haiyan smashed into the central Philippines on November 8 killing at least 4,000 people and reducing most of what was in its path to matchwood and rubble. Supporters of the worldwide Fast for the Climate movement say they will join together in a New York vigil highlighting their own climate action after writing to government leaders around the world. They have invited heads of government who will be meeting in the city at the United Nations to join them., the movement said in a statement from London on Thursday. Thousands of people began to Fast For The Climate last year to support victims of extreme weather events such as Typhoon Haiyan, and to show strong public will for urgent and decisive action on climate change. There will be a one-hour fasting vigil and photo op, parallel to the Climate Summit in the Church Center for the United Nations at the UN Plaza 777, New York on 23 September. Fasters and supporters will meet for a short presentation on two concrete climate actions - by a secular and a religious organization involved in the fast. The movement includes many environmentalists, youth groups and people of faith who are showing the strength of their commitment by going without food one day a month. This is part of a call for world leaders to do more to solve the climate crisis. In the run up to the Climate Summit in New York the movement is making a special appeal to heads of governments, and will be meeting in New York for a vigil at the UN at time of the summit. There will be a one-hour fasting vigil and photo op, parallel to the Climate Summit in the Church Center for the United Nations. The meeting will close with the lighting of candles which will form the words "ACT NOW!" The lighting will be done in silence with a musical accompaniment, allowing religious people to pray and all to partake in a symbolic call to governments. Throughout the Climate Summit proceedings will be projected on giant screens in the Church Center and this will be interrupted for one hour for the fasting vigil to take place. Many participants in the Fast for the Climate gathered in NY will be present including religious delegations who will have taken part to the Interfaith Summit on Climate Change. 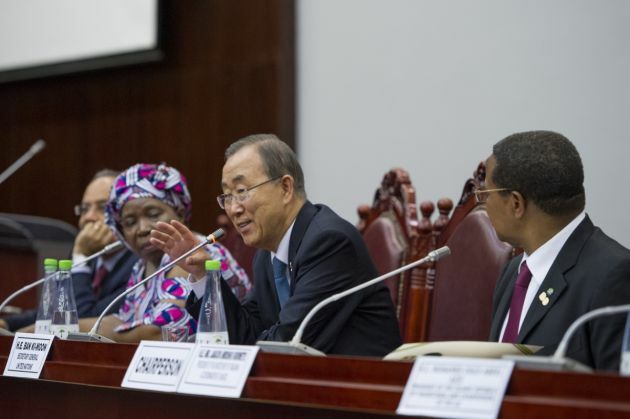 (UN Photo / Eskinder Debebe)U.N. Secretary-General Ban Ki-moon (centre right) addresses a meeting of the Committee African Heads of State and Government on Climate Change, held on the margins of the African Union Summit in Malabo, Equatorial Guinea. He is flanked by Nkosazana Dlamini Zuma (left), chairperson of the AU Commission; and Jakaya Mrisho Kikwete, president of Tanzania and coordinator of CAHOSCC. Church leaders and other prominent fasters will be present.